Directed by Busby Berkeley, known for his intricate choreography and majestic set pieces, creates a smaller-scale movie completely unattached to his typical extravaganzas. 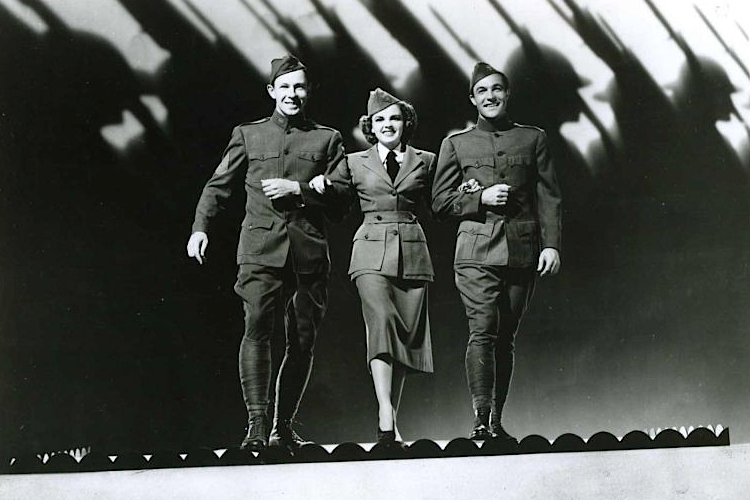 Recognized as a musical first, For Me And My Gal is also an underrated war movie, fairly different from propaganda movies at the time which encouraged joining the efforts in or examining the effects of the military for both men and women. As a budding vaudevillian act, song and dance duo Jo Hayden (Judy Garland) and Henry Palmer (Gene Kelly) slowly fall in love as they tour the U.S. in pursuit of making it to the big time. As World War I commences, and Palmer schemes his way to avoid the draft and keep them on top, breaking away from their dreams to perform at the frontlines threatens to tear them apart. Coming out during a year most hailed for the sweeping classic Casablanca, this drama-musical subtly touches on the showbiz and the war, and those who served their country or tried to evade that service. Berkeley's change of filmmaking is well-done, especially since he limits scenes, both dramatic and musical, to very few camera angles; the music isn't flashy and glamorous but buoyant and catchy, fitting right into the era of vaudeville and "clowns with the baggy pants" for who the movie tributes itself to. Earning top billing, Garland was twenty years old at the time and stuck by the studio powers-that-be to prove herself as a mature actress capable of more than slapstick (which she loved performing) or blooming romances. Just a year before she starred as a teenager in Babes on Broadway alongside tween-pal Mickey Rooney, and wasn't yet the young woman swooning over her neighbor in Meet Me In St. Lous two years later. But Garland's range in song, dance, and acting can't be praised enough in making Hayden a mature, bubbly, and courageous character. Hayden's primary romantic relationship may be with Palmer, but she also cares for her brother Danny, performing as a vaudeville star to put him through medical school. "No, I'm not good but I will be, someday," she says to Palmer, describing her own ambitions, which change after Danny enlists and she must sum up the courage to continue her dreams down a different path. The quiet moments when she is talking to him about his future, or seeing him leave for the front lines, for perhaps the last time ever, offers a real weight to the film's war angle. It's not just a backdrop threatening to tear Hayden and Palmer apart, but something that affects her deeply. She might be the girl with a big voice, but Garland knew how to be subtle, both in breaking your heart and lifting your spirits. Garland, on her own has some beautiful sequences like in performing 'I Want a Beautiful Doll' alongside George Murphy, to a heartbreaking rendition of 'After You've Gone', and hamming it up for 'Down on the Farm'. As a pair, Garland and Kelly strut their collective talent in 'For Me and My Gal' and Ball in the Jack', and a few other charming numbers. In rightful measure, Kelly might be known as one of the greatest silver screen dancers ever, but Garland is arguably one of the many female stars who made you take notice of them. It's a shame she never quite took notice of what a great, triple threat she was. Similar to Fred Astaire and Ginger Rogers, Garland and Kelly belong on screen together. Their chemistry matches perfectly, and arguably, this is the best-directed movie between the duo prior to critically-slammed The Pirate, and entertaining but mismatched Summer Stock. Their shared exuberance and execution of songs and conflict might be due to the fact that Kelly was new in Hollywood and Garland took him under her wing. Their confidence, enthusiasm, and friendship jump from the screen. And as much as this puts Kelly on the map as his first feature film, Garland continued to prove her song, dance, and acting chops. 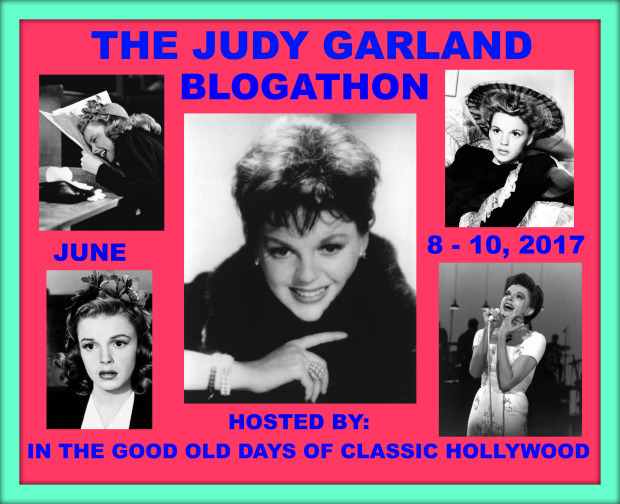 This post was my entry for Crystal's Judy Garland blogathon, where bloggers participated in celebrating Judy Garland's birthday on June 10th. She's my all-time favorite movie star, so it was a real treat to celebrate herin this way. Check out all of the amazing bloggers over at the official page here.